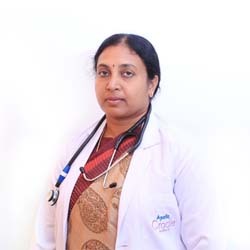 Dr. Shanthi Reddy V is a Gynecologist, Obstetrician and Laparoscopic Surgeon in Jubilee Hills, Hyderabad and has an experience of 23 years in these fields. Dr. Shanthi Reddy V practices at Apollo Hospitals in Jubilee Hills, Hyderabad and Apollo Cradle in Jubilee Hills, Hyderabad. She completed MBBS from University Of Mysore, India in 1988, MD – Obstetrics & Gynaecology from Kuvempu Univerisity in 1994 and Certificate Course in Gynecological Endoscopy from Kuvempu Univerisity in 1997. HONOURED for presentation- “ Applications of I T in OBSTETRICS & GYNAECOLOGY” at M N R MEDICAL COLLEGE, SANGAREDDY. PLATINUM JUBILEEE CELEBRATIONS OF INDIAN MEDICAL ASSOCIATION (I M A) – JAN 2009. My experience at Apollo Cradle, Jubilee Hill was excellent. I came here for my delivery and found the services to be at par. The staff here is hospitable and took great care of all our needs. Dr Shanthi is skilled and addressed all our queries efficiently. The infrastructure is good and hygiene is well-maintained. The food was provided on time and the quality was also good. I’d definitely recommend it to my friends and family. Special thanks to Dr. Shanti Reddy, Dr. Shyamla, Dr. Priyanka, sister Parvathy for their exceptional love and care during this journey of parenthood. Also, I received great help from Anita, Sarita, Bushra, Geetha and Gauri Shankar. Thanks to one and all! Thank you every one at Apollo Cradle for making this experience very pleasant and memorable. Thank you once again.